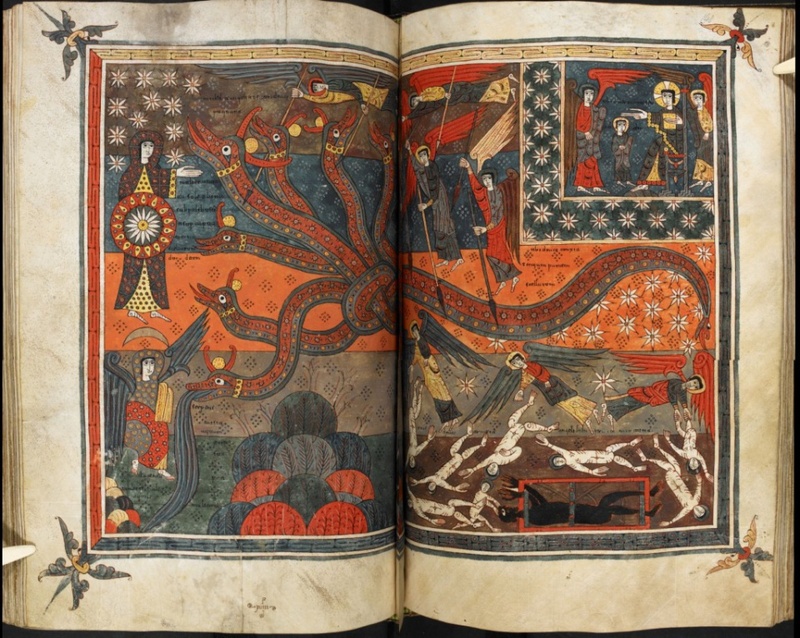 London, British Library, Additional Ms. 11695 > Beatus of Liébana, Commentary on the Apocalypse > dated late 11th-early 12th c. (1091-1109) with Antiphonarium 10th-11th c.
Why is the Silos Apocalypse important? Its beauty and excellent state of preservation would alone make this an important manuscript. But it also contains one of the oldest Christian maps of the world, reflecting the Roman view of things. East is at the top, and beyond the Red Sea is a hint of an undiscovered fourth continent that some ancient thinkers suggested must exist to balance Europe, Asia and Africa. [See the figure above: The Beatus world map, with Adam, Eve and the Serpent in the Garden of Eden at the top. The Mediterranean is represented as a blue line in the centre, the River Nile as its continuation bending to the right, and the Red Sea as a vertical red line. Two rectangular islands at the bottom left are marked Britain and Scotland. Add. 11695, ff.39v-40r © The British Library] (British Library, Online Gallery Sacred Texts). © The British Library, Add. ms. 11695, f.1r Antiphonarium. Fols. 1r-4v: Antiphonarium mozarabicum (10th-11th c.). Flyleaves added to the main codex coming from an antiphonary. The musical notation seems to have been drawn by the same copyist who wrote the text. Fols. 1r-v, the end of the mass of St Roman and the beginning of the first feria of Advent. The miniature of Hell added in folio 2r, originally left blank, was added by the same illuminator than that of the Beatus. The two crosses of Oviedo in fols. 2v and 3v belong to the original antiphonary. The anagram in fol. 4r, VPR (Vespertinum) corresponds to the first chant of Mozarabic antiphonaries being thus its first page. The anagram LUX in fol. 4v belongs to the first chant for the eve of the feast of St Acisclus (17 November), the first day of the Mozarabic liturgical year. © The British Library, Add. ms. 11695, f.6v Incipit. Fols. 218r-219v: Isidore, Etymologiae (excerpts). Fols. 220r-266r: Jerome, Commentary on Daniel. Fol. 265v Explicit explanatio Danielis propheta, XII kalendas maias, hora VI, die V feria, sub era Tª Cª XXVIIIIª, regnante rex Adefonso in sedis Toleto et Kastella, Legio adque Gallecia… (1091). © The British Library, Add. ms. 11695, f.222v The siege of Jerusalem. Fol. 267r: charter Caroline minuscule (letter of abbot Petrus relating to a distribution of the monastery’s income): Facta carta VIIII kalendas agusti, noto die Vª feria, era Mª Cª LXXXXª VIª, regnante rege Sancio in Castella, rege Fernando in Gallecia… (July 24th, 1158). © The British Library, Add. ms. 11695, f.276r Labyrinth. Fol. 276r: Labyrinth: Ob onorem Sancti Sebastiani martiri abba Fortunio librum. Munio presbiter titulauit hoc; Fol. 277v: … Ego Dominico presbiter et consanguinei mei Nunnio presbiter exigui libri huius prescribere solerter cepimus opus, erumnose uite huius peracto hoc gestum Siliensis cenobii… Perfectus est igitur hic liuer, explanationem in se mirificam continent Apocalipsis Iohannis, Christi iubante dextera, diemque temporis XIIII kalendas maii, hora VI, die V feria, sub era TCXXVIIIIª, regnante rex Adefonso… (April 18th or 19th, 1091); Fol. 278r: … explicitus est liuer reuelationis ipsius dominis nostril Ihesu Christi, editus et firmatus ab his auctoribus, id est, Iheronimo, Augustino, Ambrosio, Fulgentio, Gregorio, Ticonio, Hireneo, Abringio et Isidoro… Labor scribentis refectio est legentis. Hic deficit corpore, ille proficit mente. Quisquis ergo in hoc proficis opera, operarii lauorantis non dedignemini meminisse, ut Dominus inuocatus inmemor sit iniquitatibus tuis, amen, et pro uocem tue orationis mercedem recipias in tempore iudicii, quando Dominus sanctis suis retribuere iusscrit retributionem. Quia, qui nescit scribere laborem nullum existimat esse. Nam si uelis scire singulatim, nuntio tibi quam grabe est scripture pondus. Oculis caliginem facit, dorsum incurbat, costas et uentrem frangit, renibus dolorem inmittit, et omne corpus fastidium nutrit. Ideo tu, lector, lente folias versa, longe a literis digitos tene; quia sicut grande fecunditatem telluris tollit, sic lector inutilis scripturam et librum euertit. Nam, quam suabis est nauigantibus portum extremum, ita et scriptoris nouissimus uersus. Explicit. Deo gratias semper. © The British Library, Add. ms. 11695, f.86r This miniature of two men dancing, one with a violin-type instrument and the other holding a bird and brandishing a curved knife, represents “la dansa del gall”, a traditional dance from the Pyrenees. No. of leaves & layout: Antiphonary 4 fols. (text in fol. 1r-v; one 15-line single column); Beatus 279 fols. (395 x 245 mm); two columns-36 lines; quaternions; ruled in dry point; 37 quires; catchwords. Copyist/s: The Codex was copied by Dominicus and Munio, likely commissioned by abbot Fortunio, who finished it at the sixth hour on Thursday, April 18th1091. Illuminator/s: Dominicus and Munio must have passed the still unbound work on to the illuminators. The program of illuminations was started by an unknown expert and, after him, continued by prior Petrus (see fol. 6v), who finished it on June 30th or July 1st, 1109, being Iohannes the abbot of Silos. Colophons fols. 275v, 277v. Script: Visigothic minuscule script (some influence from Caroline minuscule). Origin: It is not known where the Antiphonary was written. 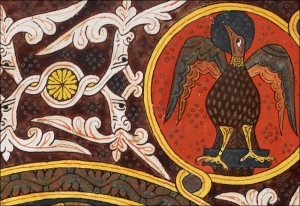 The Beatus was produced in the Monastery of Santo Domingo de Silos (Burgos). Provenance: Being finished in 1109, the codex was still in Silos in the 14th century since the same hand annotated several manuscripts from this monastery’s library. The codex left Silos on an unknown date. In the 18th century, the Silos Apocalypse belonged to Cardinal Antonio of Aragon (b. 1618, d. 1650), who apparently donated it to the San Bartolomé School in Salamanca. When the School was abolished – dissolution of the Salamancan “colegios mayores” by Charles IV (1804-1808) –, the codex was taken to the Biblioteca Real in Madrid [The codex is listed in the index of the manuscripts incorporated into the royal collection by Antonio Tavira y Almazán, bishop of Salamanca, between 1799 and 1801 (inscription ‘No. 98’ (f. 1r) relates to its number in the index)]. It may be supposed that this is from where José Bonaparte (b. 1768, d. 1844) picked it up when king of Spain (1808-1813). He subsequently sold it to the British Museum on May 9th 1840 [List of Additions to the Manuscripts in the British Museum in the Years 1836-1840 (London: British Museum, 1843), p. 4]. Context: [See Adoptionism quarrel and the first part of this post] It has been argued that, since the Mozarabic liturgy faded by the end of the 11th century, around 1061 and 1085 in Silos, the incorporation of these pages at the beginning of the Beatus served as commemoration or preservation of the Hispanic tradition. Last June I had the privilege of briefly take a look to the collection of manuscripts in Visigothic script kept at the British Library (16 between codices and fragments; see the list here). The visit was exceptionally interesting; almost all the information published to date about these codices seemed, after a first approach, not particularly accurate (or not accurate enough for me), especially regarding the attribution of origin (and, therefore, date) and hands involved in their copy. The news about this codex were the most striking for useful, moreover having perfectly identified authors and dates. Although both scribes, Dominicus and Munio wrote in the same script, Visigothic minuscule script, their writing can be easily individualised by an advanced palaeographer having one of the scribes clear influence from the abbreviation system of Caroline minuscule. Analysing their intervention in the codex, it can be perfectly seen how they both worked together, simultaneously, dividing quires. Now that the volume is bound, the last pages of some quires face the first page of the next one highlighting the graphic differences. It will be really fascinating to carry out a detailed palaeographic analysis to see who copied each quire to reconstruct how the codex was done. Beato Magio o The Morgan Beatus, dated c. 926 (New York, The Pierpont Morgan Library, MS 644) [here]. Beato de San Millán de la Cogolla, dated c. 950/955 (El Escorial, Biblioteca del Monasterio, &.II.5) [here]. Beato Emilianense, dated mid-10th c. (Madrid, Biblioteca Nacional, Vitr. 14-1) [here]. Beato de la Rioja o de la Seu d’Urgell, dated 10th (La Seu d’Urgell, Biblioteca de la Catedral, Ms. 26) [here]. Beato de Tábara, dated c. 970 (Madrid, Archivo Histórico Nacional, cód. 1097B) [here]. Beato de Valcavado o de Valladolid, dated c. 970 (Valladolid, Biblioteca de la Universidad, Ms 433) [here]. Beato de Girona, dated c. 975 (Girona, Arxiu de la Catedral, Ms. 7) [here]. Beato de San Millán de la Cogolla, dated late 10th c., 11th c. for illuminations (Madrid, Real Academia de la Historia, ms. 33) [here]. Beato de Facundo o de Fernando I, dated c. 1047 (Madrid, Biblioteca Nacional, Vitr. 14-2) [here]. Beato del Burgo de Osma, dated c. 1086 (Burgo de Osma, Catedral, Cód. 1) [here]. The BL MS 11695 is available online at the BL Digitised Mss catalogue. A detailed archival file is available here. 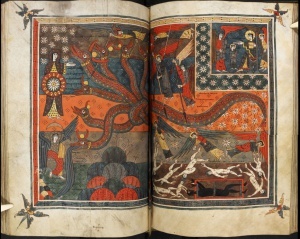 The ‘Silos Apocalypse’ is part of the exceptional online exhibition about Sacred Texts and has also been cited in several posts published in the British Library’s Medieval manuscripts blog (eg. here, here, and here). There is a facsimile edition of the codex by Moleiro, which includes comments about some historical and codicological aspects of the Silos Beatus (by Miguel Vivancos) and its illustration (by Ángela Franco). M. C. Díaz y Díaz, Códices visigóticos de la monarquía leonesa, León 1983, 312-313, nº 19 and 399-400, nº 115 (antiphonary). A. Millares Carlo, Corpus de códices visigóticos, Las Palmas de Gran Canaria 1999, nº 106.